900 million years ago, according to the June Astronomy magazine, Earth’s day was only about 18 hours long. 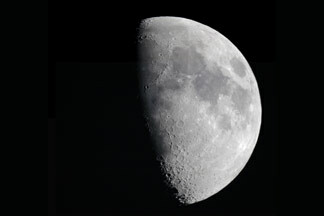 Our planet’s rotation has slowed since then due to the tidal drag or friction of the oceans as the Moon pulls. Due to the law of conservation of (angular) momentum, this also resulted in the Moon gradually increasing its orbital distance from Earth. Doesn’t everybody occasionally yearn for that extra hour of sleep in the morning? Getting up for work 900 million years ago would have been a real drag, especially since coffee hadn’t been invented yet. The really good news is that, if we’ve gained 6 hours a day in the last 900 million years, then, assuming the process is linear, we’ll have 25-hour days in only another 150 million years. And that means we’ll finally be able both to sleep in, and get to work on time, for the first time in history. And if you were thinking of just holding out until that blessed day, I’d recommend extra-heavy duty batteries for your alarm clock. This entry was posted in General and tagged Commentary, Solar System by Alex. Bookmark the permalink.